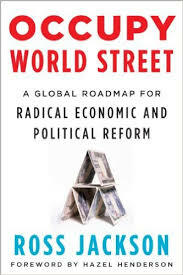 Occupy World Street; is an excellent primer for anyone wondering how the global economy got to where it is now. Jackson provides a pithy overview of the role of the Bretton Woods institutions, particularly over the past three decades, as well as the policy changes that allowed financial institutions to precipitate the sub-prime mortgage crash. Jackson offers something for everyone from the befuddled citizen and novice activist to the well-informed academic. Though the first half makes for a shocking and disheartening read, Jackson’s book does not wallow in guilt and despair. Rather, Jackson deftly outlines how Lovelock’s Gaia hypothesis can be used to make the world a more equitable, environmentally responsible and financially stable place. Jackson proposes that the a Gaian Development Bank, Gaian Clearing Union, and Gaian Trade Organization must replace the World Bank, IMF, and WTO (among others). These new institutions would be based on a new Gaian worldview that incorporates the human with the natural world. Therefore, the institutions would run on a system of ecological economics that takes the limits of an ecosystem into account to better ensure economic and environmental sustainability. Other less lofty solutions Jackson proposes are increasing reliance on biomimicry, permaculture, and ecovillages. Occupy World Street, like the Occupy Movement, transcends class, culture, and educational background to inform if not inspire readers.